Ever wanted to make your own yogurt instead of buying those over-priced gourmet yogurt cups from Whole Foods? Or perhaps you're a bit fastidious about your health and want to create yogurt that you know is made correctly and packed with all the nutritional benefits that store-bought yogurt skimps on? Well, now you can. You can make homemade yogurt without needing to concern yourself with cooking mistakes. Automatic Yogurt Makers can significantly decrease the workload. The models we review below allow you to pour your prepared natural yogurt creation in to the yogurt maker's cups, configure the digital countdown timer, and after cooking for several hours you'll have ready-made yogurt ready to eat. These digital yogurt makers allow you to manage the sweetness, flavoring, consistency, as well as the fat content of the yogurt, so that you can take charge of that which you are consuming. Common features include automatic shut-offs, intuitive programming controls, and multiple jars. Let's take a look at 5 of the best sellers on the market today. 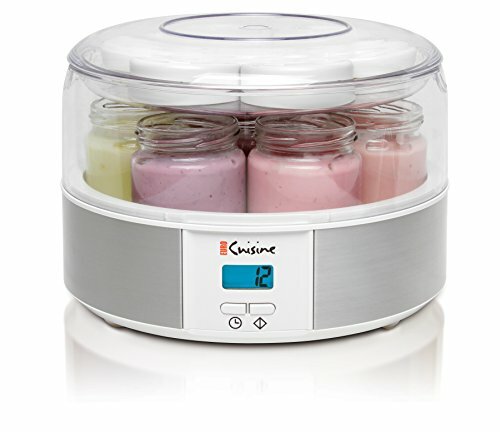 This seven-glass, Euro Cuisine Yogurt Maker is an efficient yogurt maker designed to provide fuss-free and delicious homemade yogurt anytime. Its users love the timer mechanism and seven glass jars, which help in preparing different flavors at a time, but also find that the temperature, which is very important for yogurt making is not always easy to maintain. The YM80 Euro Cuisine has timer feature for setting the cooking time of yogurt and the glass jars are completely dishwasher-safe. The YM80 is a good choice if you are looking for a yogurt maker that does the basic functions without many advanced features, such as an automatic temperature adjustment. This automatic shut-off, 4 lb YMX650 Yogurt maker from Euro Cuisine could be a great buy for yogurt lovers. It follows a fairly efficient process, which makes it pretty simple to workflow. Its users love the automatic stopping feature with a countdown timer for 15 hours, but also note that the heating is not always done in a smooth manner. The YMX650 lets you have full control over the fat content, consistency, flavor and sweetness, ensuring you have tasty and delicious yogurt outcomes the majority of the time. The Automatic Euro Cuisine yogurt machine is an effective choice if you want a trouble-free and tasty yogurt. This automatic-cooling, stainless steel, CYM-100 Cuisinart yogurt maker could be a good option for you if you are looking to create a lot of different flavors of yogurt in huge quantities. Its users like the 50 ounce container and digital display for timing their yogurt creations, but they note that the temperature is not always easy to control. 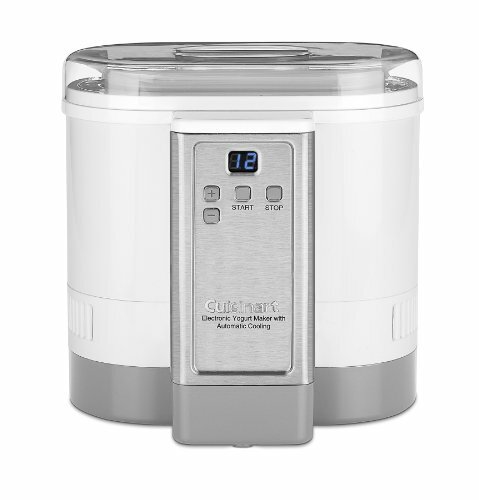 The Cuisinart yogurt maker has an automatic cooling shut-off-mechanism inbuilt in the machine that is activated when the processing time for yogurt is over. 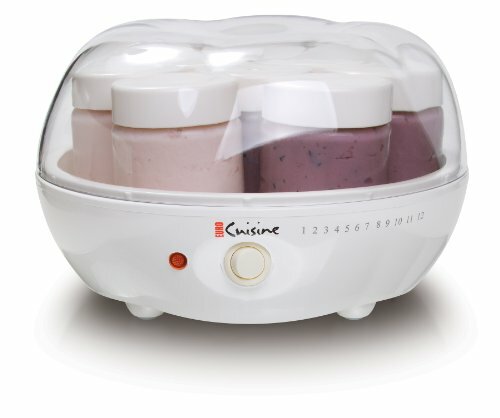 This 120 volt, CYN-100 yogurt machine is a choice to consider if you are looking for a reliable and fast yogurt maker. This 1.7 lb, extra-compact Dash Bulk machine for yogurt is an efficient device that gives you fresh, delicious and homemade yogurt with just a touch of a button. Its users love the fast and smooth way the yogurt processing is done, but do note that the temperature is difficult to maintain. This yogurt maker with its one quart container can produce in bulk, so users can enjoy a ton of flavored yogurts at a time- with the topping of their choice in a healthy and nutritious way. 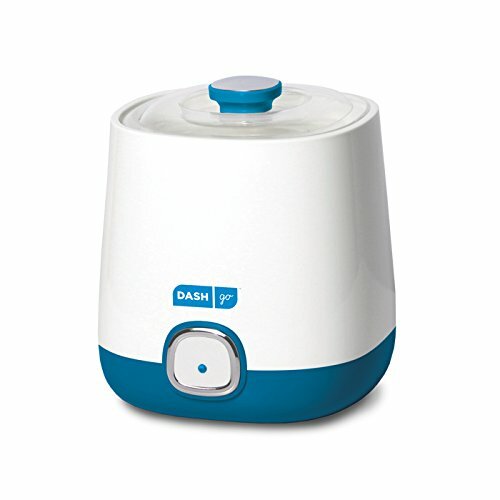 The Dash Yogurt maker fits on any kitchen counter with its compact design and is a great product if you want healthy homemade yogurts of different varieties and flavors without spending too much. This 3.6lb, seven 6oz. glass Epica yogurt maker is another solid digital yogurt machine to make healthy, delicious and creamy yogurt, even if you are a total noob. Its users find the two minute preparation recipes easy and effective, but also hate the tug of war they have to wage to remove or place the lids on. The Electric Yogurt machine from Epica comes with guaranteed optimal temperature maintenance to produce safely cultured yogurt. 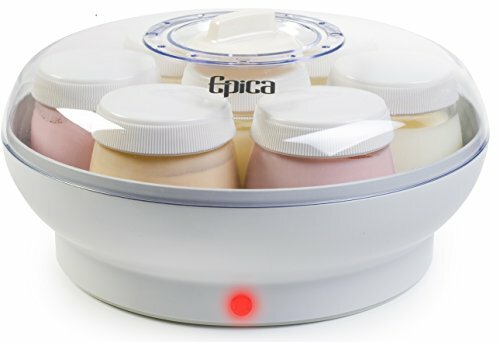 The Epica Electric organic yogurt maker is an effective buying option if you are making yogurts for the first time, and need a worry free, inexpensive and fast machine. Digital yogurt makers are designed with a heating element to keep your ingredients at a constant temperature that will cook your ingredients into a healthy and delicious yogurt. Some users have learned some interesting lessons regarding using a digital yogurt maker. Unlike bread machines where you just put the ingredients in, walk away, and return to fresh and delicious creations, you will still have to boil the milk, have a cool, mixing some starter ingredients and then add it to the digital yogurt maker to cook. This means that you are doing a good deal of legwork before you are putting your ingredients into the electric, 'automatic' yogurt maker. It is not advisable to add flavorings like fruit during the cooking unless they have been sterilized. You can add vanilla or other like flavorings but fruit is not advised-this means that generally you'll be making a couple cups of plain yogurt and then flavoring it as you eat it. 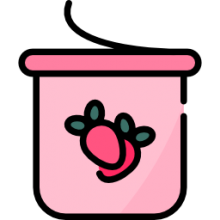 Another important note that users made, is that for the electric yogurt makers that feature several small cups, is that since you're not individually flavoring each one, it would be more efficient to have a large quart-sized bucket to make the yogurt in rather than several small cups. Common features, users note, of digital yogurt makers intuitive control panels that frequently are digital displays, programmable timers, thermostats, automatic shut-off capability, dishwasher safe lids as well as multiple reusable yogurt cups. One Aroma Housewares digital yogurt maker purchaser was incredibly pleased with the easy to use interface. She writes that set up was pretty easy-she powered it up, waited for the digital display to blink on, added the time in hours and minutes that you desired, and press the start button. In terms of the recipe, she brought the milk down to 110 Fahrenheit, supplemented it with several tablespoons of sugar added to the milk, and then added Greek yogurt without gelatin along with some more tablespoons of cold milk which she thoroughly mixed. She notes that she will probably splurge on an extra set of cups for her yogurt maker so that she can queue up another batch of fresh yogurt while the other ones are still in use in the refrigerator.